You get a ticket, and walk up to the sandwich counter. The sandychef asks you what you want, and you say a pastrami sandwich. He carves a sample hunk of pastrami off of a slab of meat, hotel buffet prime rib style. You eat it, and are amazed. He proceeds to pile several slices of the pastrami onto some hearty rye bread and hits it with some mustard. You take the finished sandwich and a plate of half- and full-sour pickles back to your table and delight in the game-changing awesomeness of the mountain of pastrami you are devouring. Peppery, moist, incredible. The bread's tang cuts the savoriness well, as do the pickles, and, if you're bold, the can of Cel-Ray celery-flavored soda you ordered. 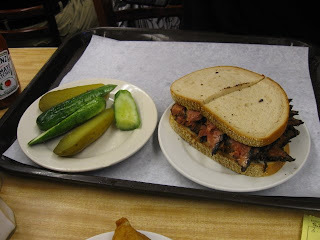 If you care about meat, a trip to Katz's Delicatessen is a must. My time there ruined my corner deli hot pastrami on ryes going forward. This is the Wayne Gretzky of pastrami sandwiches. Go to New York. Get one. What other sandwiches are essential? Let me know. What does celery flavored soda taste like? Is it sweet? It's slightly sweet, but mostly it tastes like celery. It's worth trying once. They usually have it at Redwood Deli.